I have a feeling he wants to create a button on the main menu that will send a message to a particular server, and if the admin of that server replies with a "yes" then the client automatically connects to that server. ... 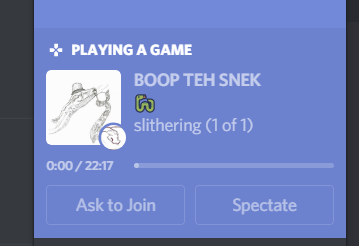 In this menu, Discord allows game creators to add two buttons: "Ask to Join" and "Spectate". ... to give more information about the game, so instead of it just saying "Playing <game name>" it can show up with something like seen in the video. (With the server icon as the big square, and the crafting table as the small logo).